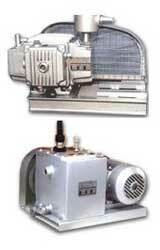 Avail technically advanced Rotary Vane Vacuum Pump from us. The Rotary Vane Vacuum Pumps are used in vacuum drying, vacuum lifting of non-porous material, vacuum impregnation, and vacuum ovens. Highly popular among the clients in India and international market, the Pumps are available at the most competitive price as compared to other manufacturers in the industry. Model Free Air Displacement (LTRS/MIN.) H.P. Reqd. Oil Charge In Ltrs.